I recently saw an adorable poster that read, "When in doubt, put a bow on it." How appropriate for this gorgeous Hello Fab ring? This bow ring is the perfect icing on the cake! Love this layered look - So cute! Chambray shirts with lots of layers are my go to look right now. I love this outfit and that presh bow ring! Happy New Year! Love the stripes with the plaid, and I'm seriously seriously loving the sunnies!! lovely outfit, this is something I would wear. such a fabulous look! love that dress with shirt on top! cute scarf too! Love the mix of relaxed pieces with dressy. Great winter outfit. love this! so classic in all this snow! that chambray blouse is the perfect denim color. and i am obsessed with that scarf! cute! You're right, that ring is the cutest little touch! And I'm drooling over your watch. Love your outfits! I love your Target booties and the coat! You look so warm and stylish in the snow! Love this outfit - the mix of plaid & stripes is so cute and I'm in love with those booties! I love this look for a mountain getaway! So cute and cozy! I love the chambray with the stripes! The denim with the stripes is great! And I love your jewelry! I love all the layering you did! You look so cute and those BOW ring is fabulous! I am so in love with this entire outfit! Looking great as always! I love everything about this. I want to recreate it immediately. Although it looks so cold I don't know how you took your coat off! You look adorable! 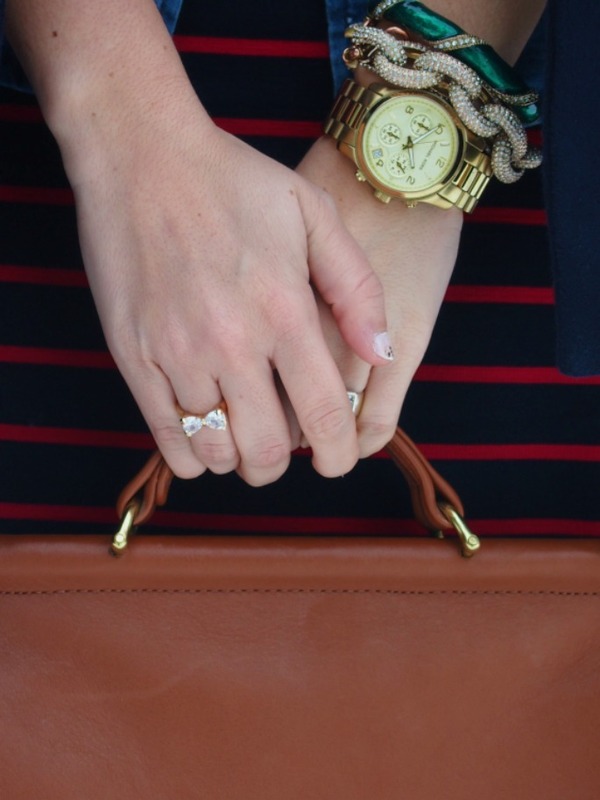 Perfectly accessorized and just warm enough for the cool weather! Lovely outfit! Love the mix of prints with the skirt and scarf. That pop of plaid is making my DAY.